Gallia Academy’s Sarah Watts strides along the course during the Skyline Bowling Invitational on Oct. 2 in Centenary, Ohio. CHILLICOTHE, Ohio — The Gallia Academy, Meigs and Southern cross country teams competed at 2018 Unioto Invitational held Saturday on the campus of Unioto High School with eight local runners placing in the top-25. A total of 199 varsity participants competed in the event, with Chillicothe coming away with the boys team title and Teays Valley capturing top team honors in the girls event. Both varsity races featured over 50 runners apiece, with 124 boys and 75 girls taking to the course in the separate competitions. Chillicothe posted a winning score of 22 points in the boys race, finishing 41 points ahead of runner-up Teays Valley (63). Gallia Academy placed sixth overall in the team standings with 147 points, as Todd Ellott (19:34.74) paced the Blue Devils with a 14th place effort. Chancy Odom (20:44.03) was next for GAHS with an 28th place finish, while Nicholas Sheets (21:33.77) and Gryatt Schwall (22:24.88) followed with 44th and 52nd place efforts, respectively. Ethan Lawer finished 60th with a mark of 23:25.53, while Chris Dennison (26:28.94) was next coming in at 96th overall. Derek Henry (26:45.28) followed with a 99th place effort to round out the top-seven finishers for the Blue Devils. Meigs’ Colton Heater (19:31.35) was the top local finisher in the boys race as he led the way for the Maroon and Gold with a 12th place finish. Christian Jones (21:13.67) was next for MHS with a 36th place effort, while Landon Davis (21:24.36) followed with a 40th place finishes. Brandon Justis (30:09.66) rounded out the top-four efforts for Meigs placing 115th overall. Andrew McCallum of Chillicothe won the boys race with a time of 17:35.63, with Hunter Morgan of Whiteoak coming in second with a mark of 17:48.54. Gallia Academy’s Sarah Watts won the girls race with a time of 21:01.63, while Carson Jones of Western Brown was the runner-up with a time of 21:55.69. Teays Valley came away with the girls team title after posting a winning total of 22, while Logan was second with 51 points. Gallia Academy rounded out the top-three girls team totals with 70 points. Inex Perez (28:26.32) and Taylor Facemire (31:33.18) rounded out the top-seven finishers for Gallia Academy with 44th and 58th place efforts, respectively. 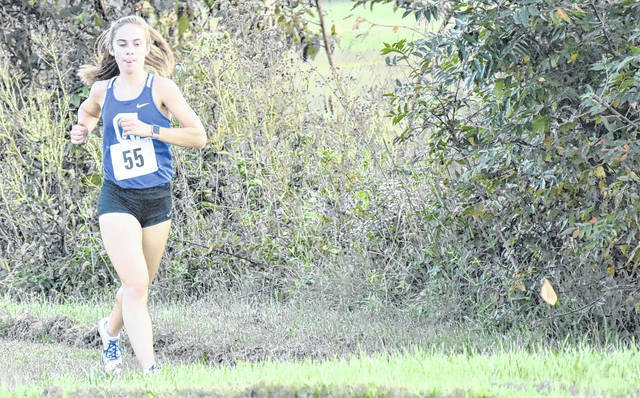 Mallory Johnson paced the Lady Tornadoes, placing 12th with a mark of 24:06.63, while Kathryn Matson (28:32.93) was next with a 45th place effort. Madison Cremeans was the lone representative for the Lady Marauders, placing 15th overall with a mark of 24:19.48. Visit baumspage.com for complete results of the 2018 Unioto Invitational.